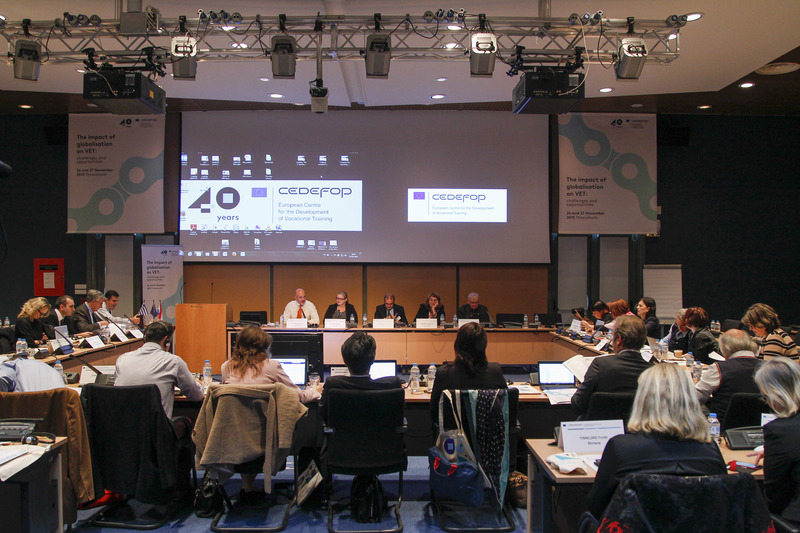 Participants at Cedefop's conference (26-27 November) on the impact of globalisation on vocational education and training (VET) agreed that the new connected world affects VET in multiple ways and that vocational skills have to be adaptable and at the centre of a global agenda. Globalisation and rapid technological developments (e.g. digitalisation) transform occupations in some sectors, creating new jobs, while some skills become quickly obsolete. In this rapidly changing landscape, education and training must allow workers and learners to develop transversal skills, transferable from one job to another, from one sector to another and to accredit any skills which could be recognised and enable people to remain employable and to compete in the labour market. To make this happen education and training must stay ahead of developments or at least follow them closely. Keynote speaker Patrice Guézou, from France's Chamber of Commerce and Industry, quoted Jack Welch, CEO of General Electric to describe the challenge we are facing: 'If the rate of change on the outside exceeds the rate of change on the inside, the end is near.' He noted the emergence of supranational brands in education and training, adding that the worst solution would be to try and impose a model on all educational systems while the best to co-design a tool, diploma etc. The Cedefop conference gathered over 100 participants from over 30 countries, including Australia, New Zealand and India, and more than 20 European federations, associations and international companies to share views on how we can develop VET for a globalised economy. It focused on issues related to whether and how international standards are used to broaden national qualifications and to influence VET content, the opportunities offered by international qualifications to strengthen employability and the conditions for a successful cooperation at different levels. The conference identified various challenges to be addressed. The rapid rate of changes puts pressure on national systems to update and renew their VET standards, qualifications requirements, programmes and curricula. Governance is a complex issue and cooperation between different actors in education and training and the labour market may become difficult as a common language needs to be used to make them work effectively together. In a globalised context, where different forms of VET provision and qualifications appear and new players (international sectoral bodies, multinational companies) provide training and award qualifications, national authorities must set the right conditions for quality assurance to strengthen trust and credibility of these sectoral, international solutions. It was agreed that learning outcomes have great potential as a common language between actors within and across sectors. Participants discussed the idea to strengthen the European dimension by developing core sectoral occupational profiles following the example of Australia with the APEC region and the ‘sustainable professionalisation’ project that some national qualification authorities in Europe tested several years ago. Cedefop follows related developments and will embed these discussions in its work on qualification frameworks, quality assurance and credit systems as well as its research on learning outcomes, curricula and validation of non-formal and informal learning. It will deepen the knowledge basis on the way globalisation is changing VET in two studies to be launched in early 2016 - one on VET's changing nature and role and another on the impact of globalisation on VET.